John Buis has lived his entire life in North Delta. A 33 year veteran of the RCMP, there are very few individuals who have or ever will accomplish as much as John in the sport of basketball in British Columbia. Playing his high school basketball at North Delta Secondary School, he was twice a BC high school all-star in 1972 and 1973. Only one other Delta player in the 65 year history of the BC tournament has ever equaled this achievement. From 1974-1978, he won numerous awards while a member of the BC College Championship Team at Vancouver Community College and the Vancouver Puccini’s Senior A Mens Team. Although John was an outstanding player, his major accomplishments in basketball have been that of a Builder. In one capacity or another, he has been involved with the BC High School Boys Basketball Tournament since 1974. First as a Games Assistant from 1974-1979; as the Assistant Tournament Director from 1980-1991 and from 1992 to the present, the Tournament Director. His overall responsibilities include the complete organization of the BC High School Boys AAA Tournament at the Agrodome every March. Since 2001, John has been the President of Basketball BC, except for a two year period between 2003 and 2005 when he was seconded by the United Nations for a Canadian peace keeping mission in East Timor. Prior to this, he was a member of the Board of Directors of Basketball BC from 1997-2000. He has served as a Canada Basketball Hall of Fame and BC Basketball Hall of Fame selection committee member from 2003 to the present. John also represents Canada on the Central Board of FIBA America’s world basketball committee, a position which takes him to all parts of North, South and Central America. His recognition awards and distinctions in basketball are very impressive. Beginning in 1996, he received the Basketball BC Special Merit Award. He was honoured by Sport BC in 2001, with the Presidents Award in recognition of dedication to high school sport in BC. He became a Honourary Member of the BC High School Basketball Association in 2002 and was Basketball Canada’s Provincial President of the Year in 2007. 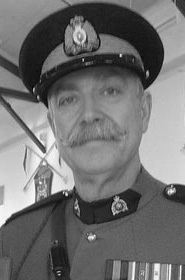 John Buis has also had a stellar 33 year career with the RCMP. His duties over this period of time have included general duty and investigation, emergency response team member, tactical troop member, media relations specialist, UN police monitor, watch commander and most recently as a District Commander in Burnaby. In 2006, he received the Order of Merit of the Police Forces which is an Order of Canada award, the highest award Canada bestows on its police forces. John Buis has significantly contributed to the advancement of basketball in Delta, BC and Canada. His induction into the Delta Sports Hall of Fame is well deserved.